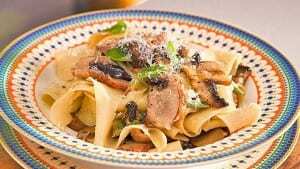 Masterchef contestant Justine Schofield has put together the perfect pasta dish to suit any night of the week! Bring a large pot of salted water to boil. In a large sauté pan, heat oil over a medium heat. Add the garlic and marjoram and cook for 1 minute or until it just starts to colour. Add the mushrooms and sauté for 5-6 minutes or until they start to colour. At this stage add the pasta to the boiling water and cook as per packet instructions. Now add the duck to the mushrooms, season with salt and pepper and add the wine. Bring to boil, then add the butter and the balsamic. Once the pasta is cooked, add directly to the sauce and agitate the pan to combine evenly. Serve in two bowls with freshly grated Parmesan.